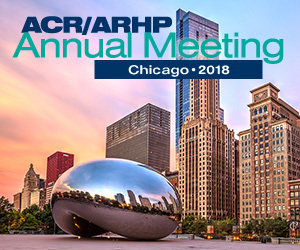 Background/Purpose: Rheumatoid factor (RF) and antibodies against citrullinated peptides (ACPA) are established markers in the diagnostic approach to rheumatoid arthritis (RA). Both auto-antibodies (AAB) also have a prognostic value, since they are associated with more aggressive, destructive disease 1.Therefore decreases in AAB levels may be highly relevant to improve the long-term outcome of RA. We aimed to investigate the changeability of ACPA and RF levels under anti-rheumatic therapy, with special focus on the influence of treatment response. Methods: We obtained data of outpatients from a long-term observational database with prospective data entry. We retrieved clinical and serological data of patients treated with traditional disease modifying anti-rheumatic drugs (DMARDs) and/or biological response modifiers from the treatment start and after 6 months of therapy. We used non-parametric tests to analyse changes of ACPA and RF levels between the two visits, as well as differences between treatment responders and non-responders. SDAI50 criteria were used to define treatment response 2. Furthermore, we investigated the trend of ACPA, RF and SDAI over a period of 18 months. Results: 143 ACPA and RF positive patients were included. As depicted in Figure 1, the median (25th /75th percentile) relative changes after six months were -35.6% (-63.3; -8.3) for RF, and -15.2% (-40.0; 10.0) for ACPA (p<0.001 for both). The changes of RF levels were significantly greater than those seen for ACPA (p<0.001). 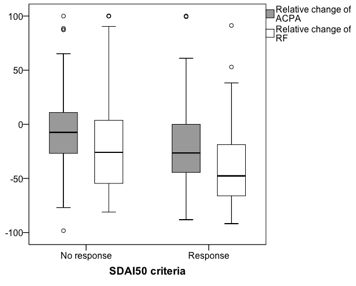 SDAI50 response was achieved in 60 (42%) patients. 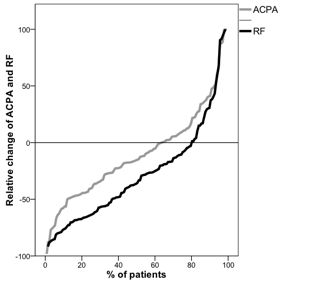 As can be seen in Figure 2, the decrease of ACPA and RF was significantly higher in patients with treatment response than in those without (p=0.034 and p=0.01, respectively). After 3 months the decline of ACPA, RF, and SDAI amounted to 4.6%, 13.2%, and 23.5%, respectively; after 12 months it was 16.9%, 31.4% and 40.5, and after 18 months 23.8%, 35.2%, and 44.3%, respectively. Conclusion: ACPA and RF levels decreased significantly after 6 months of therapy. Reduction of both AAB were closely linked to a reduction of disease activity. RF declined faster, to a larger extent and in greater numbers of patients than ACPA. Further research is needed to investigate whether reductions of ACPA and RF levels are associated with a better radiographic outcome. 1. De Rycke L et al. Ann Rheum Dis 2004;63(12):1587-93. 2. Aletaha D et al. Ann Rheum Dis 2012;71(7):1190-6.